Beautiful Bathrooms has been a family owned and run business for over 40 years offering the very best and latest in fully fitted bathrooms and we pride ourselves on years of excellent customer service both before, during & after sales, from the smallest of accessory to fully fitted bathroom installations our attention to detail is unparalleled. Our luxury fitted bathroom showroom has grown to become one of the largest in South Wales. We’re suppliers of top brand names and the only showroom in South Wales with the Stonearthrange of solid oak cabinets & solid surface finishes, Ideal Standard‘s latest collection. We have various displays showing the Ambiance Bain fitted furniture including moulded resin worktops, Aquadi Fitted Furniture, Grohe Showers, Zehnder Radiators, Twyfords Hydr8 and ES400 range of shower cubicles, plus Clearwater Clearstone Baths to name just a few. We have bathrooms to suit your every need & budget all under one roof. Our company works with a no pressure sales approach, feel free to call in for a coffee and browse at the fitted bathrooms we have on display, our staff will be more than happy to answer any questions. Our FREE no obligation, plan & design service is offered with the latest in 3D computer aided design software that make your dreams become reality. All work is covered by our 12-month guarantee and will be installed by one of our own fully qualified expert installers. Be sure to visit our online section of fitted bathroom galleries where you can inspect for yourself many of the finished fitted bathroom installations & we’ve also included some case studies where you can see the process of before, during & after installations so you can see the detail of our work. We’re able to project manage your complete fitted bathroom installation from concept to completion and cover all aspects including wet room installations, all plumbing work, wall & floor tiling, plastering, electrical works, building work through to decoration. We’re able to cover all areas of the UK for deliveries & installations as you can see for yourself in our completed case study in West Berkshire. Please be sure to take some time to read some of the hundreds of our customer testimonials from our customers dating back to the 1980′s! 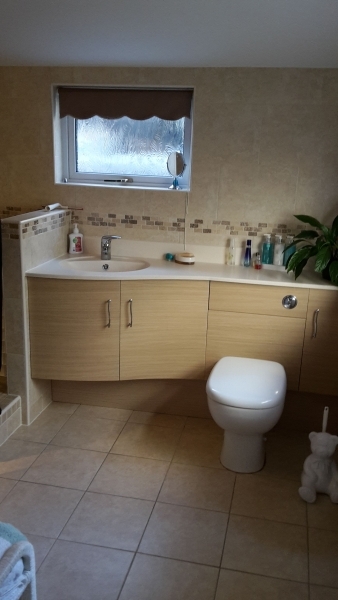 Also look at our photographs showing some completed bathroom installations.